WISER took the first step toward new endeavors in surgical simulation with the introduction of a new course offered by the Department of Cardiothoracic Surgery. The course, titled "Preparation for CT Surgery Training: Patient Care Problem Based Learning" was held on Saturday June 29th, 2013 and will be the first in a series of courses focusing on surgical simulation. There were 10 cardiothoracic residents and four practicing surgeons in attendance; the surgeons were Danny Chu, MD, FACS, Christopher C. Cook, MD, Jonathan D'Cunha, MD, PhD, FACS, and Peter F. Ferson, MD. The day consisted of several lectures from Dr. D'Cunha, Dr. Chu, and Dr. Cook, followed by four different practice scenarios which were set up in an oral board format. 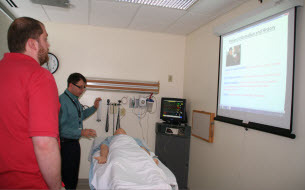 Each resident visited all four of the simulation rooms, each with a different patient. Each room had a display of the patient's history and current vital signs. The assigned attending surgeon updated the patient's information as the resident walked them through the plan of action they would take with this patient. 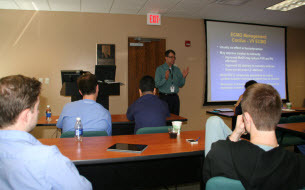 The day concluded with a debriefing session for the residents and attending physicians. A short post-test was given at this time, which was used to determine how much knowledge the residents gained when compared to the pre-test that they took before the course started.